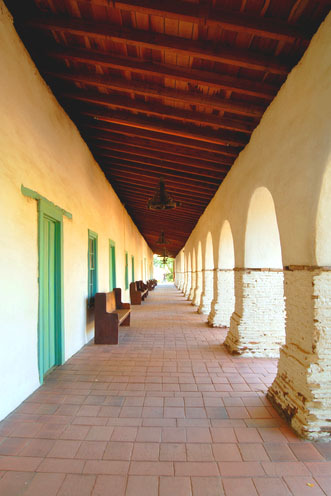 Sept. 19-20, 2009 is a big weekend for the sleepy town of San Juan Bautista, population 1600. 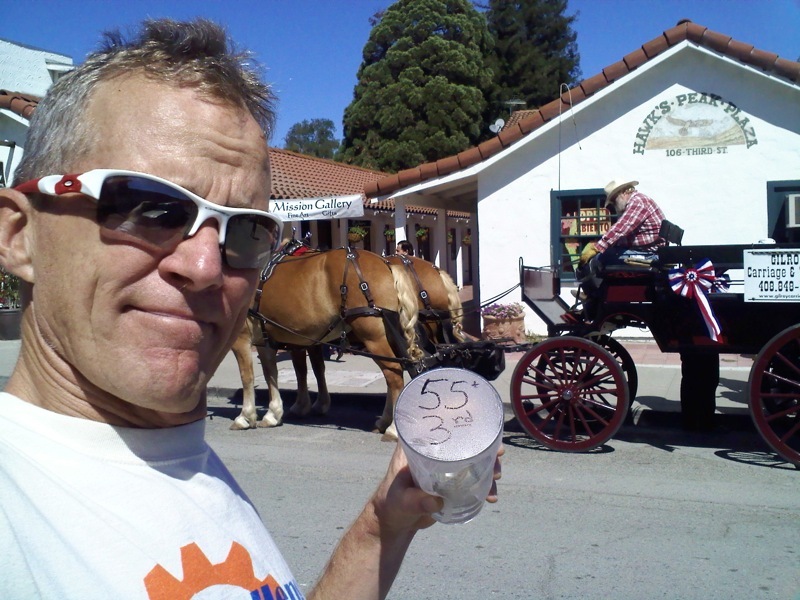 Just off of Hwy 101 between Gilroy and Salinas, CA, the town is not only hosting the Chicken Festival, but it’s also the date of the 2009 Fremont Peak Hill Climb, put on by Greg Bloom, a man who clearly understands the connection between beer drinking and bike riding. What is the Chicken Festival? The two-day event, running from 10 a.m. to 5 p.m. on Sept. 19 and 20, features arts and crafts booths, a parade, live music, and various chicken-themed events, such as crowing contests, chicken bingo, a chicken dance contest and the crowning of a chicken queen. The Fremont Peak Hill Climb is a 10 mile, 2500′ climb up to nearby Fremont Peak. I was able to pull off a 3rd place in a very tough Master’s field to bring home a beer glass and 10 bucks. 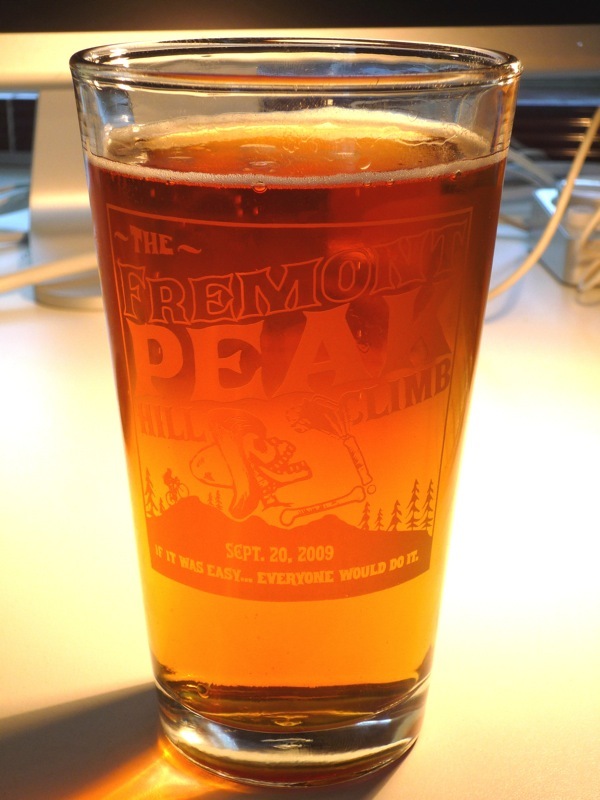 The beer glass is etched with the words, “If it was easy…everyone would do it.” Damn right. It’s a beautiful climb, characterized by constantly changing pitches, terrain, and plant communities, the kind of climbing I love. We roll out on relatively shallow grades and a good clip, mostly above 20 mph. When the pitch kicks up, Mac Carey takes a stab at an attack. I’m able to answer, as are about half the field. He eases up for a bit, then goes again. This time the field is shattered. The 55+ 1,2,3 field is racing with the 35+ 4 and 45+ 4 fields. Carey is first, World Champion Scott Hennessey is second wheel, and I’m third. Organizer Bloom offers a free beer to anyone who beats his personal record, 46:15. We pass a sign part way up that says “Beer Pace 19:20.” I look at the clock. We’re at 19:00 flat. All good. After a while I slip back a bit and ride in about 8th place. The pace is too high for me and my legs are not quite recovered from last week’s Everest Challenge. Carey and Hennessey are still off the front showing the younger dudes how it’s done. As the grade steepens in the upper part of the course I dig in a bit and begin picking off riders. Near the top I’m riding in 3rd overall with Hennessey in sight. At the top there is a short downhill, then a false flat to the finish. I see the 1K to go sign and I’m at around 45 min. Looks like I’ll miss the beer. Lord knows I try but my finish effort isn’t quite enough. I finish in 46:40 for 3rd overall and 3rd in my Master’s group. The 55+ dudes take the first 3 places in our mixed field, which is pretty cool. The good news is that I do score the coveted beer glass, and some cash, reserved only for the top 3 finishers. After the event we go “downtown” to the Chicken Festival for the awards at Jardines Mexican Restaurant. It’s great being in the town during their big annual event and parade. Bands are rocking, bars are hopping, and people are dancing in the sun. Not the typical Sunday in SJB. Chillin’ in Downtown SJB with the beer glass. Kudos to Greg Bloom for putting on such a great event. I’ll be back next year to fight again for another beer. Nice ridin! Eva and I climbed up Fremont Peak about a month ago on the tandem when we were smoked out of Santa Cruz. We even did the last little road up to the radio towers, great views. Keep up the good work, I enjoy your write-ups.